In the months since the liquefied natural gas export project was approved by the Federal Energy Regulatory Commission, Dominion has hit the ground running to have its Lusby export facility operational by late 2017. An offsite area in Solomons is essentially complete, said Bob McKinley, vice president of Dominion Cove Point Liquefied Natural Gas construction. The temporary pier built to receive shipments from barges on the Patuxent River, which was approved by the Maryland Board of Public Works, will start operations in the spring. Dominion Resources is suing more than 40 landowners in Virginia who won’t allow the energy company to survey their properties for a proposed $5 billion natural gas pipeline. 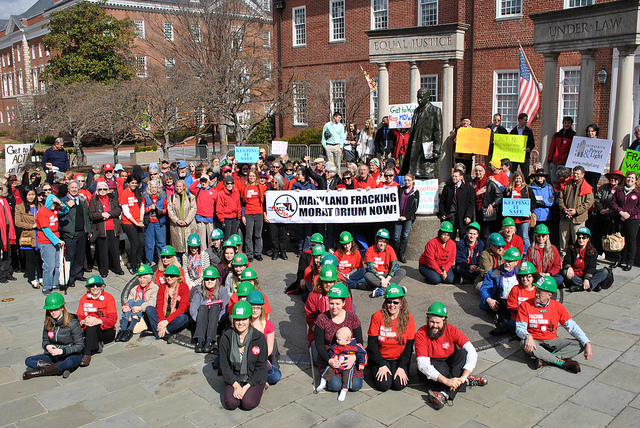 Rally for fracking moratorium in Annapolis in 2013. Photo courtesy of CCAN. What do public health advocates like me tell people all the time? Get tested. Use protection. In practice, that means we’re always explaining how everything from cancer screenings to immunizations to bike helmets can save lives. The same logic ought to apply to natural gas drilling. Take what’s happening in Maryland, my state. 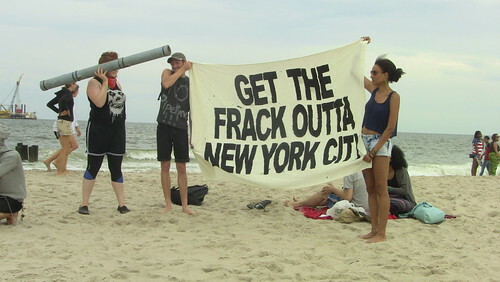 Until now, Maryland has banned the controversial gas-drilling process commonly known as “fracking.” That’s kept a portion of the Marcellus Shale formation — a gas-rich stretch of bedrock that stretches from New York State to Tennessee — off-limits to frackers. Maryland was the only state to complete a public health study of the impacts of fracking before drilling. The participants found fracking to have a high or moderate likelihood of negative impacts in seven out of eight core areas — including air quality, water quality, occupational health, and earthquakes, among other things. Before Election Day, Maryland Governor Martin O’Malley, a Democrat, had supported a moratorium on fracking in the state. After Republican Larry Hogan — who has publicly stated his support for drilling — pulled a surprise win in Maryland’s gubernatorial race, however, O’Malley switched gears. A new study by a team at the University of Texas, published in Nature News, throws cold water on bullish US natural gas production forecasts by the US agency, the Energy Information Administration. Its analysis suggests that the fracking boom will be a relatively short-lived phenomenon, which raises doubts about the attractiveness of investing in shale plays and in liquified natural gas transport facilities, particularly for export. Notice that this big red flag about the size and durability of the natural gas bonanza hasn’t hit the mainstream media yet. For instance, today one of the lead stories in the Financial Times is US oil reserves at highest since 1975: Shale revolution transforms country’s energy supply outlook. 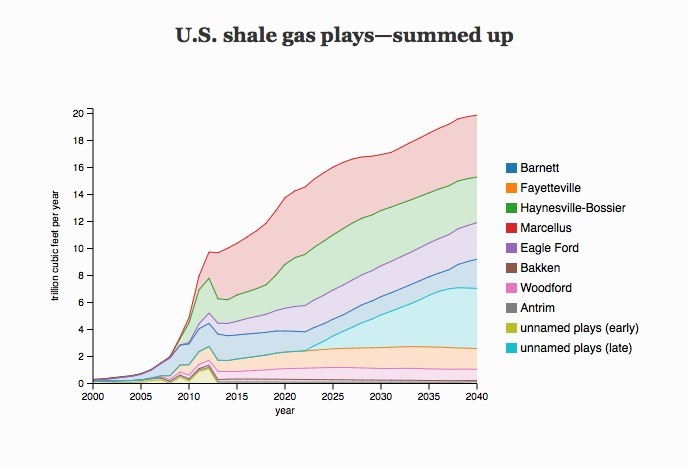 Specifically, the study finds that shale gas output will peak ramp up sharply to 2020, consistent with the EIA’s projections. However, the EIA calls for continued solid growth through 2040. The Virginia Southside Expansion in red with two new compressor stations. Gas is now flowing through Transco’s Virginia Southside Expansion. It meets up with the Transcontinental mainline in Pittsylvania County, VA. The additional 100 miles of pipeline will deliver natural gas originating from fracking wells in northeast Pennsylvania, which routes through connecting pipelines to the Transco mainline. On [December 1, 2014], Transco began partial service of 250,000 Dth/d on its Virginia Southside Expansion. Transco has historically transported about one-quarter of the gas consumed in Virginia and nearly all of the gas consumed in North Carolina. Virginia Southside expands existing facilities in southern Virginia, allowing the pipeline to increase deliveries by 270,000 Dth/d. The project is primarily designed to fuel Dominion Virginia Power’s new 1,300 MW power plant in Brunswick County, VA.
Virginia Southside consists of about 100 miles of new 24-inch diameter pipeline extending from the Transco mainline in Pittsylvania County, VA, and into Halifax, Charlotte, Mecklenburg, and terminating in Brunswick County. 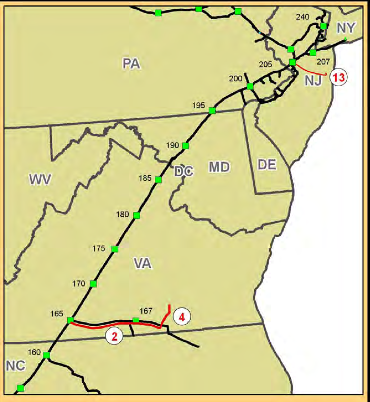 The project modifies Transco’s existing mainline to allow for natural gas to flow south rather than north, to provide gas transportation capability from Transco’s pooling point in Mercer County, NJ (see Daily GPI, Nov. 22, 2013).